Acrylic Gel K 85 | ... for Acrylic Paintings | Mediums & Varnishes | Mediums, Binders & Glues | Kremer Pigments Inc.
With the Acryl Gel K 85 you are able to produce paints that are suitable for filling. For a thin application of the paints you can add water. 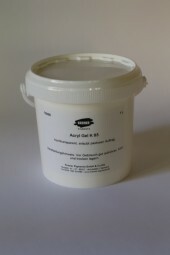 Customer evaluation for "Acrylic Gel K 85"